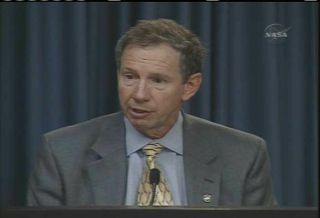 NASA chief Michael Griffin briefs the media on Discovery's planned STS-121 mission set to launch on July 1, 2006. CAPE CANAVERAL, Fla.-On the eve of NASA's second shuttle launch since Columbia accident, the space agency's top official defended his decision to press ahead with the mission and stressed the inherent risks of human spaceflight. NASA chief Michael Griffin said Friday that he believes the space shuttle Discovery is ready for its Saturday launch, but added that an element of risk plagues every orbiter liftoff. "We are playing the odds," Griffin told reporters here at NASA's Kennedy Space Center (KSC) spaceport. "What you pay us for as taxpayers is to understand those odds." The space shuttle Discovery is poised to launch seven astronauts on NASA's STS-121 mission at 3:48:37 p.m. EDT (1948:37 GMT) on Saturday. The decision to launch Discovery and its seven-astronaut crew on their 12-day STS-121 mission rests squarely on Griffin's shoulders after two top shuttle officials-Christopher Scolese, the agency's chief engineer, and safety lead Bryan O'Connor-voted earlier this month not to go ahead with the planned space shot. Griffin's rationale for signing off on Discovery's planned launch instead of waiting for a better understanding of fuel tank ice frost ramps, which have been known to shed foam during past shuttle launches, revolved around the lack of a near-term fix and the ability of shuttle astronauts to stay aboard the International Space Station (ISS) for later rescue if their spacecraft is damaged. "I very strongly feel that we are not risking crew, for foam in this case, or I wouldn't feel comfortable launching," Griffin said. Scolese and O'Connor cited the risk to Discovery-not its astronaut crew-posed by launch debris from foam-covered ice frost ramps along the spacecraft's 15-story fuel tank. Ice frost ramps are known to shed some pieces of foam during launch. Foam shedding at launch led to the 2003 Columbia tragedy that killed seven astronauts, and was later seen on NASA's first return to flight mission-STS-114 also aboard Discovery-last summer. NASA has addressed the foam problems that afflicted both Columbia's last flight and the STS-114 launch, but does not yet have a good fix in hand for the ice frost ramp foam issue. "Flying the shuttle is not without risk for many reasons way beyond foam, in fact I worry that we spend so much time worrying about foam that we won't worry about other things that could get us," Griffin said. "We try to address them all." Discovery's STS-121 mission will mark NASA's second orbiter test flight since the Columbia disaster. It will also return the International Space Station (ISS) to its three-astronaut capacity by ferrying European Space Agency (ESA) astronaut Thomas Reiter to the orbital laboratory. Once complete, the mission will open the door to complete construction of the ISS, which has been stymied by NASA's efforts to return its aging three-shuttle fleet to flight status. Numerous ISS components built by NASA and its ISS partners have been stuck on Earth during the agency's return to flight process. "We have obligations to our [international] partners and we intend to fulfill them," Griffin said. "Our partners have been very understanding of the fact that we're coming through a tough time in the American space program and we're kind of doing the best we can here."